So what happens when you combine: A bunch of garden kale ready to be picked, a couple of packs of mushrooms, one just-starting-to-wrinkle bell pepper, a few potatoes on the verge, and a batch of homemade vegetable broth — plus a little container of heavy cream you may have impulse bought at Trader Joe’s? 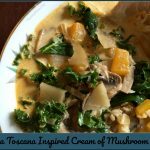 Welllllll… on Meatless Monday, all of these things just might add up to one big batch of Zuppa Toscana Inspired Cream of Mushroom Soup. This is, more precisely, what might happen when you’re craving Olive Garden but trying not to eat out (and it’s Monday, and you don’t have any Italian sausage in the house to try a more traditional Zuppa Toscana recipe, and you start playing around in the kitchen… 😉 ) Although this may seem like a weird mashup, it really works! Here’s how. Heat olive oil in large pot or Dutch oven over medium-high heat until shimmering, then add onion and saute for three minutes. Add mushrooms, garlic, bell pepper, adobo sauce, sea salt, and smoked paprika and continue sauteing over medium-high heat for another eight minutes or until mushrooms have softened. Stir in broth, water, black pepper, crushed red pepper, parsley, and potatoes and cook over medium heat for another 30-40 minutes or until potatoes are soft, stirring occasionally. Reduce heat to medium-low. Stir in cream, then ladle a little of the broth into a separate bowl and whisk it with flour until no longer clumpy. Stir flour/broth mixture back into soup to thicken it slightly, stir in kale, and simmer on medium low for another couple of minutes until kale is bright green. Serve immediately, topping with shredded Parmesan if desired. 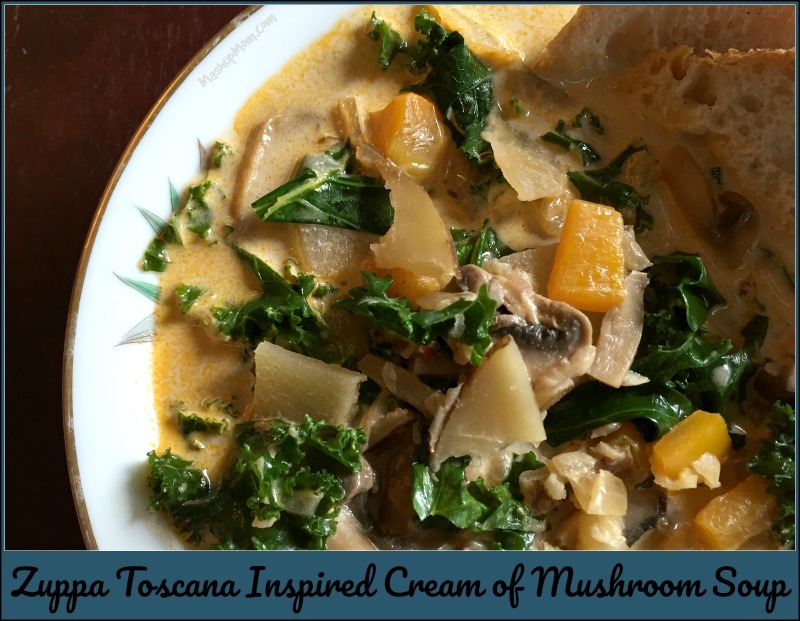 Does this creamy mushroom soup taste like Zuppa Toscana? 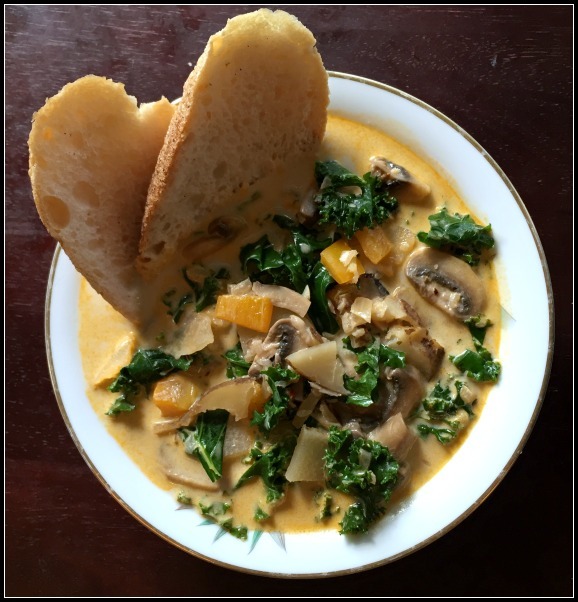 It does not, per se, but it’s reminiscent of Zuppa Toscana with its underlying smoky flavor, creamy broth, and bites of kale and potatoes. Does it taste like cream of mushroom soup? It kind of does, but it’s also slightly spicy, kale-y (OK, that’s not a word), and smoky. 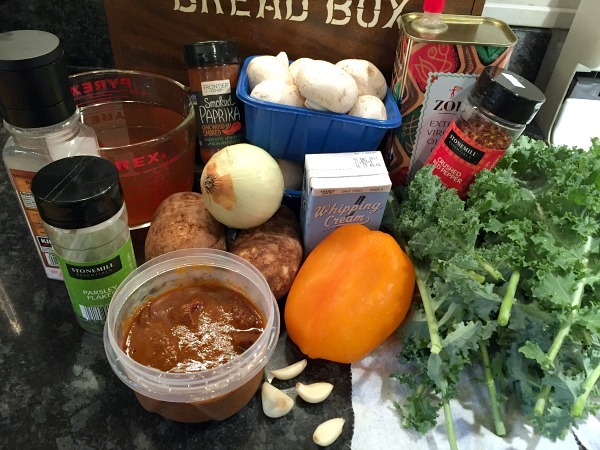 It’s hard to describe, because this is not exactly like any soup I’ve had before — yet it’s darn tasty! 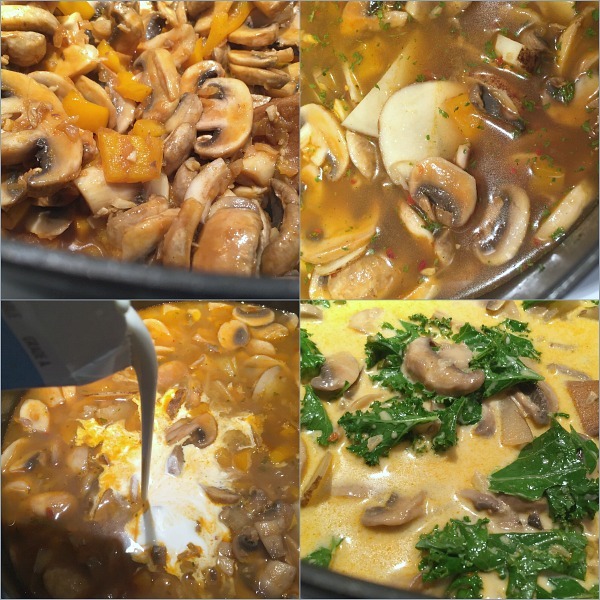 Give this veggie-filled & gluten free (assuming your flour is…) vegetarian soup recipe a try on your next Meatless Monday, and browse more Meatless Monday recipes here. Note: If you're gluten free, just use a gluten free flour to thicken and the rest of the soup is naturally gluten free.